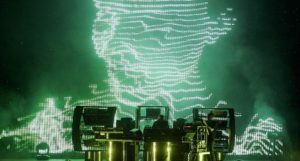 The Chemical Brothers have announced their first live show in legendary London venue, Alexandra Palace. The inimitable electronic act will bring their ferocious, multi-sensory live extravaganza to the 10,000 capacity venue on October 5th. Following the release of their 2015 album ‘Born In The Echoes’, it was announced that one half of the pair, Ed Simons, would not be touring anymore as he was focussing on academic pursuits. It has not been confirmed whether he will be returning for their 2018 shows or not. Since that decision was made, Tom Rowlands has been joined on stage by Adam Smith, who directed the immensely visual and animated ‘Born In The Echoes’ live show. The Chemical Brothers will be embarking on a European tour this summer that will see them playing at several festivals. They will also be playing at Boardmasters festival in Cornwall in August. Tickets for the show in Alexandra Palace go on sale Friday 23rd February from Ticketmaster.